Having Standard Chartered account but you never tried Immediate Payment Service (IMPS). Great, here is one great deal waiting for you. Get Rs. 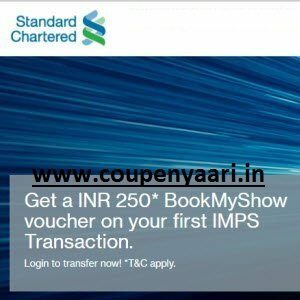 250 BookMyShow voucher on your first IMPS Transaction. IMPS is an instant interbank electronic fund transfer service through mobile phones. How to Get Standard Chartered Free Rs. 250 BookMyShow voucher on 1st IMPS Transaction? We are delighted to inform you that you can now use RTGS facility for your transfers using online banking and Breeze Mobile. A real-time gross settlement system (RTGS) is a facility to transfer of funds to other banks on a “real time” basis without any waiting period. RTGS facility is available on Online Banking as well on Breeze Mobile. Minimum transfer amount for RTGS facility is INR 2 Lakh or above.. To know maximum daily funds transfer limit, please login to online banking and check limits under My preferences > Funds Transfer Limit menu. RTGS facility is subject to existing limits offered under InterBank Funds Transfer service of online banking. RTGS facility is only available between 9:00 AM to 4:00 PM (Monday to Friday and on all Saturday* except 2nd and 4th Saturday. In our endeavour to uphold the highest banking standards, we have volunteered to adhere to the regulations of Banking Codes and Standards Board of India (BCSBI). BCSBI is an autonomous body that monitors, develops and enforces minimum standards all banks must follow while dealing with customers. To view the codes, please click here .